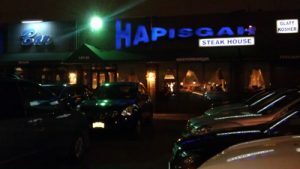 Hapisgah, New York’s first Glatt kosher Steak House was established in 1990. A beautiful 150 seat restaurant, complete with background music and an intimate atmosphere, Hapisgah is well known for its excellent service and high quality. There is also a bar fully stocked with your choice of beer, wine, whiskey, or any other alcoholic beverage. In addition, food service is available at the bar.Over the years Hapisgah has become distinguished as the place for great tasting, sizzling steaks, as well as items from the grill, we have many rich and delicate dishes available on our Italian Menu. We welcome you to click on any of the links above to explore our tantalizing choices we offer. Hosting a party? Hapisgah can cater in your home or hall – everything from a buffet to a full grill – we will even bring the waiters and full service! Let us make your event hassle free from beginning to the end – all you have to do is eat, enjoy and collect the compliments! Hapisgah is under strict supervision of the “Vaad Harabonim of Queens” with a steady Mashgiach from opening to close.